Today I’ve got some fab new supplements to tell you about from Chemist Direct. I have the Regener8 Super Anti Oxidant / Antiaging Formula and Regener8 Hair Nutrition Formula. My diet is far for perfect and I do worry that my body might not be getting all the nutrients it needs, plus my hair is a complete sore point (it doesn’t grow) so if these supplements can help with these issues then they’re definitely worth taking! Both are tubs contain 60 tablets – they’re the clear style largish capsules, so you can see the powder inside. Regener8 Super Anti Oxidant/Anti Ageing Formula is perfect for those who are looking for an extra boost and a helping hand in combatting the feelings of stress and the effects it can have on the body. Each capsule has been clinically designed to give you the best possible support, so you are able to face the day with added energy and vitality. They are made using a powerful blend of essential anti-oxidising properties, including stress relieving Vitamin C, E and Selenium, as well as a host of natural ingredients, which are all carefully selected to revive and rejuvenate your health. Vitamin C – Protects skin cells and skin’s support structure against UV damage. Vitamin E – has antioxidant capabilities that help reduce cellular damage caused by free radicals within the body that can lead to skin’s premature ageing. Vitamin A – helps protect the body’s cells from the damaging effects of free radicals and inhibits the excessive oxidisation of fats, which can be harmful to the body and cause premature ageing. Selenium – boosts your body’s natural immune function to provide you with a range of health benefits. Biotin – is a coenzyme that contributes to the normal release of energy for use in the body. It also plays a vital role in the supporting general health. Coenzyme Q10 – is critical for the release of energy from food. Pine Bark Extract – links to reducing the appearance of skin fatigue (wrinkles, creases etc) as well as being shown to boost brain function. Grape Seed Extract – helps to repair connective tissue damage and promote skin enzyme activity. Bilberry Extract – links to improving vision, and contains resveratrol which is rapidly gaining interest as an anti-ageing formula. 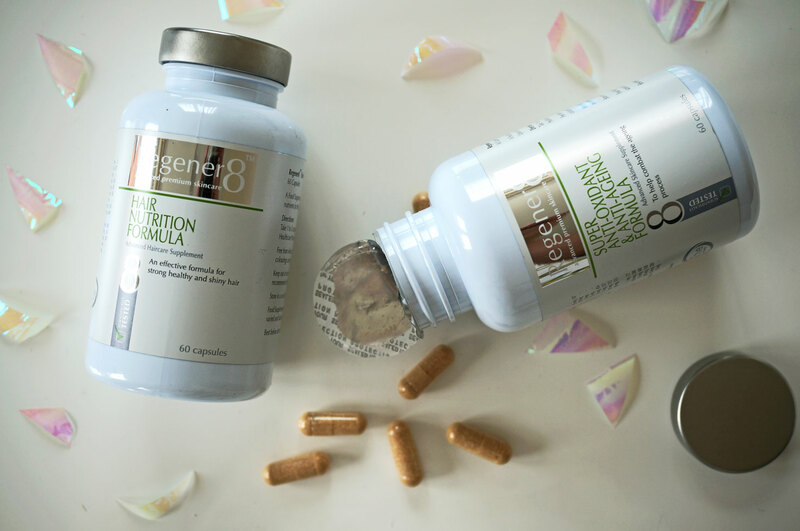 Regener8 Hair Nutrition Formula is an innovatively unique formula that delivers all the vitamins, minerals and nutrients you need to nourish hair and leave it feeling lusciously healthy. Containing a blend of natural super-foods, Spirulina and Kelp, as well as an abundance of B complex vitamins, Regener8 enhances your hairs ability to grow, shine and look silky smooth.This is the perfect supplement for you if you want hair that’s not only shiny and strong, but well nourished from the inside out. Spirulina – is one of the most complete food sources available, containing a vast array of natural nutrients ideal for supplying your body with all the goodness it needs. Kelp – has been linked to stimulating hair growth. The seaweed is a rich source of minerals including calcium, iodine, zinc, magnesium as well as vitamin A & K and amino acids. Vitamin B – contained within the vitamin B complex are two nutrients that have been linked to reducing hair loss – Choline and Inositol. Vitamin E – has the antioxidant capabilities to help reduce cellular damage caused by free radicals within the body that can lead to skin’s premature ageing. Zinc – is an essential trace element and has been linked to help treat a range of skin conditions including dry itchy skin and damaged skin. Zinc is also vital in stimulating growth. Previous Post Luxury Gift Guide For Her!